As the Civil War drew to a close, ardent Confederate Edmund Ruffin decided he’d rather die than live under the rule of the “malignant, perfidious, & vile Yankee race.” Ruffin plotted his suicide carefully, delaying the act some weeks so that he wouldn’t cast gloom over his nephew’s upcoming wedding. Then in June of 1865, Ruffin put a rifle muzzle in his mouth and, using a forked stick to pull the trigger, fired. His final diary entry proclaimed his “unmitigated hatred of Yankee rule—[and] all political, social and business connection” with the fascistic Union. There are any number of ways one could come to Ruffin. I came to him through, of all things, dirt. Because here’s the contradictory thing about Ruffin. Along with being a rabid advocate for slavery and secession, Ruffin also led the charge for agricultural reform in the antebellum South. As editor of the Farmer’s Register and author of such works as Essay on Calcareous Manures (a real page-turner that diagnosed—correctly—that what Old South soil needed was a healthy dose of marl), Ruffin spent forty years begging farmers in the Piedmont to change their destructive attitude toward the land. He was, in this way, among the nation’s earliest conservationists. So what does it mean that this man, who so blatantly disregarded the human worth of African Americans, was such a vigilant defender of dirt? There are deep ironies worth parsing in someone who would the support the perfect submission of the slave while claiming that the land deserved the master’s respect. It’s sorting through this irony, I think, that led to a weird and inexplicable compulsion I developed sometime last year for visiting historically-preserved plantations. Actually, it was really just one plantation, one particular patch of dirt called Stagville, about fifteen miles from where I live in Durham, North Carolina, that, in 1860, was home to the wealthiest family in the state and their nearly nine hundred slaves, not to mention vast acreage of corn, wheat, tobacco, and the “Sweet Mountain Peppers” and “Champion Strawberries” the Stagville women ordered from New York and planted in the kitchen garden adjacent the Big House. The last time I visited Stagville, I got a flat tire coming down the dirt drive. I didn’t notice it so parked and rambled into the Visitor Center to see about a tour, a tour which I’d been on probably a dozen times. This time, however, I was the only visitor. But the hourly tour must go on, so I was led to the Bennehan house by my guide, a reticent, Appalachia State history major and Stagville intern named Nick. Poor saintly Nick, touring around an avid doctoral student who had not only visited the site many, many times but had also wiled away her summer at the University of North Carolina archives, knee deep in Stagville’s paper trail. Standing in front of the portrait of Thomas Dudley Bennehan, Nick explained, as all the guides do, that Bennehan, the plantation’s heir, never married or had children. Then, standing there and leaning ever-so-slightly in, Nick revealed that Stagville historians now suspect that Bennehan was the father of Virgil, the family’s most trusted slave, whom Bennehan freed in his will, the only Stagville slave to be freed thus. Standing there in the awkward intimacy of Nick breaking script to utter the illicit truth of all plantations everywhere—that fathers owned their sons and their lovers—at this moment, the Stagville manager entered to ask if I was the owner of the Honda with the flat tire. Lucky for me the manager knew how to patch a tire. Not twenty minutes after driving the busted thing to the back of the Visitor Center where the manager had all manner of tools and glues and pumps, he called me from the Gift Shop (think of that) to come see the repair. “Want to know what pierced your tire?” he asked. Then he held out to me a thin, white, triangular splinter. “It’s some kind of bone,” he said, “probably some kind of animal bone.” Perhaps. And that would be a perfectly good story to tell. But I am more inclined to believe that what pierced my tire was some bit of the marl—fossilized seashells—that, at Edmund Ruffin’s urging, slaves were ordered to apply at Stagville to resuscitate the dying land. It’s no simple thing explaining why I keep going back to Stagville or, for that matter, why I will spend the foreseeable future writing about slaveowners who, in a painful disconnect, nonetheless stewarded the piedmont land I live on now. But I think the white shard has something to do with it. Literary critic Timothy Morton describes “ecology” as the unfathomable connections across beings, across time, across space. To stand on a plantation—indeed, to be stranded on a plantation because the environment, the dirt, has held you there—is not to be any more ecological than one always already is. But it is, for me at least, to feel one’s ecological-ness in a profound and awkward and transformative way. It is to feel involved and arrested by history and environment. 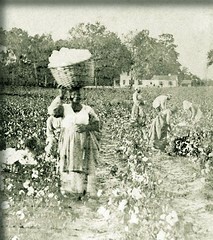 When I’m on the plantation I am reminded that global processes, to which our rhetoric often ascribes agency (capitalism does X, globalization causes Y), are composed of infinite, fine-grained, local details—like one plantation in the Piedmont—and that the local is always a site of struggle and uncontainability. Buried in the final section of the first volume of the History of Sexuality, Michel Foucault writes that it “is not that life has been totally integrated into techniques that govern and administer it; it constantly escapes them.” So while the plantation was a scene of terrible subjection and, preserved, monumentalizes that terribleness in ways that its euphemisms and Gift Shops and holiday festivities sometimes threaten to but cannot finally disavow, it is also always a scene of the escape of life from power. I’m a Yankee, transplanted from New York to the North Carolina Piedmont like Stagville’s kitchen garden plants. But if by “perfidious” Ruffin meant “deliberately faithless,” I am by no means that, as I am in unmitigated connection with the land he was always seeking to revive. Posted in The Wide, Wide World and tagged Civil War, Ecology, Edmund Ruffin, Plantations, Stewardship, Succession. Bookmark the permalink. Lynne Feeley for Avidly. AND EDMUND RUFFIN! Michael Bibler, take note. Also, Jedediah Purdy, note your fellow piedmont traveller. I thought this looked familiar: I’m on her committee (and she’s done great research for me). How’d you find each other?! Avidly unites the good peoples!